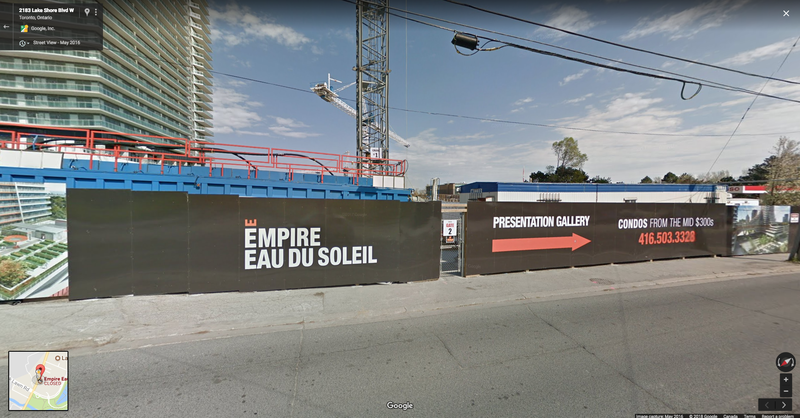 We just love seeing the transformation happening in South Etobicoke at Eau Du Soleil, and apparently Google does too. We came across these Google Street View shots dating back to 2011 where you can see the just how far the corner of Lake Shore Blvd W. and Marine Parade Drive has come in the last few years. 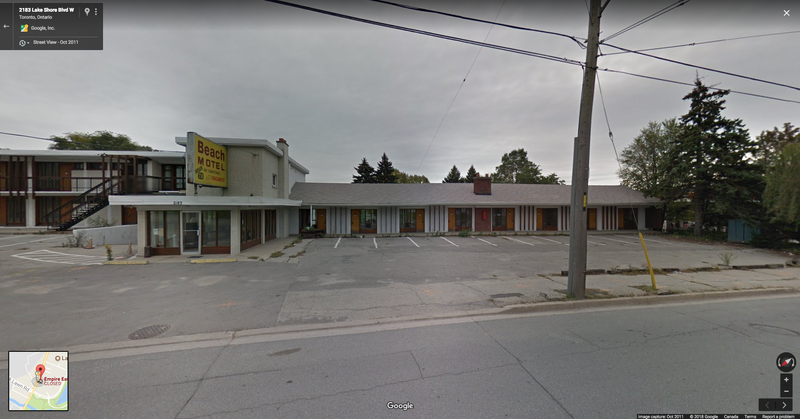 Google Street View captured a photo of the last motel of Etobicoke’s legendary Lakershore strip. During the 1950s and 1960s, this area was a hot spot for holidaying families from all over the GTA. Here’s what the site looked like in 2011 just before development plans began. Google Street View dated 2011 on Lakeshore Blvd West. 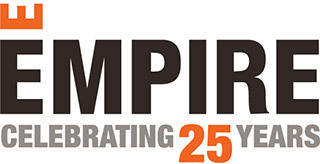 The first hoarding for Empire’s Eau Du Soleil project went up around the Beach Motel site in 2012. 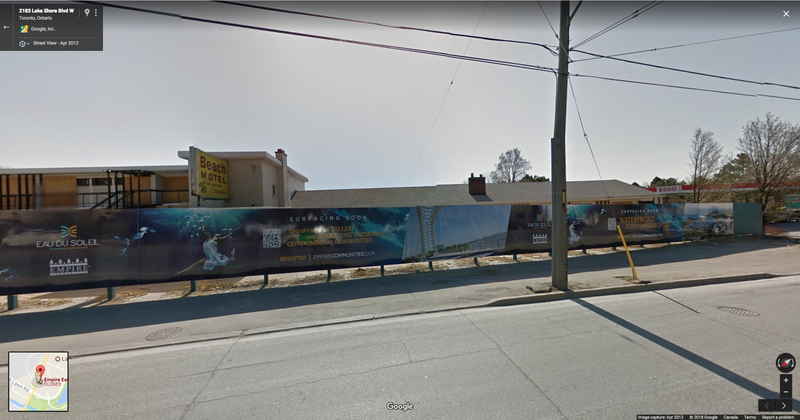 Google Street View dated in 2012 on Lakeshore Blvd West. In 2014, the Beach Motel is demolished and our first crane is visible from the street as well as our updated hoarding. 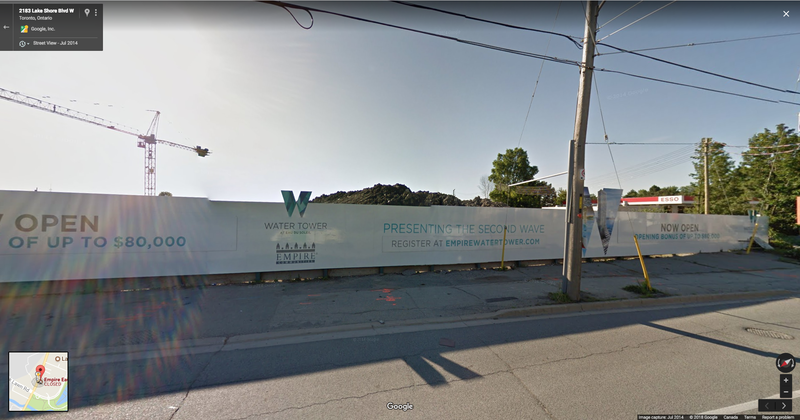 Google Street View dated in 2014 on Lakeshore Blvd West. 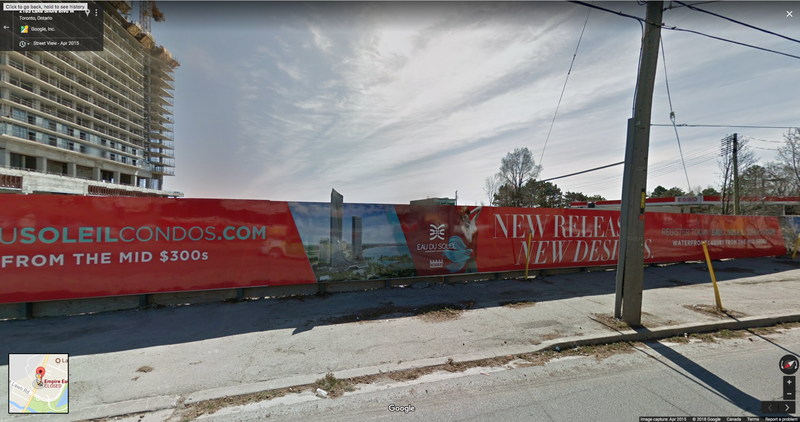 The rising of Jade Condominiums is visible on the left with some new updated hoarding of Eau Du Soleil. Google Street View dated in 2015 on Lakeshore Blvd West. Jade condominiums construction is well out of view while our second crane has been assembled with new hoarding on the street. Google Street View dated in 2016 on Lakeshore Blvd West. A distorted Jaguar F-Type sports car drives past Lakeshore Blvd West as pillars rise from the ground of the construction site. View more photos during this time here. 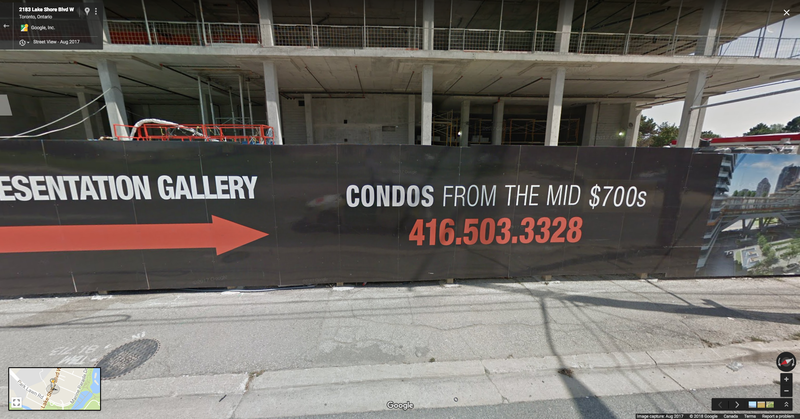 Google Street View dated in Nov. 2016 on Lakeshore Blvd West. A year later, Eau Du Soleil is well underway and out of view as construction continues. View more photos during this time here. 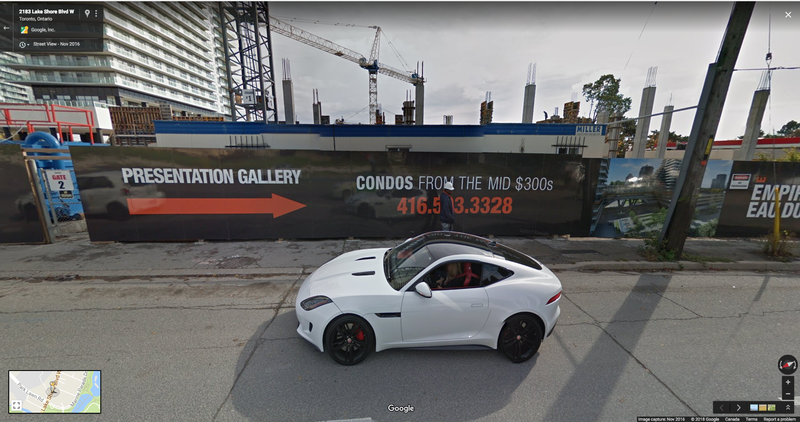 Google Street View dated in Nov. 2017 on Lakeshore Blvd West. Craving for more? Take a look at our past construction updates of Eau Du Soleil as history unfolds on the Toronto skyline.